Step It Up on the Dance Floor. Silent Auction Staggered Closings Begin. Please, no feathers, glitter, or balloons. Thank you! Event parking: Please use the main parking lot, and enter through the visitor's center, a shuttle will transport you to the Conservatory. Timing - The Gala begins at 6:30 PM and ends at 11:00 PM. Bars are open until 11:00 PM. Dining - Passed Hors d'Oeuvres will be served as you come in. Dinner stations with world class offerings prepared by Longwood Garden's chef, open at 7:00 PM and will be located in the Patio of Oranges. The Dessert Bar (with coffee) opens at 9:00 PM. Entertainment - We will have a DJ on the main dance floor to help us dance the night away...more details to come! Registration (Visitor's Center) - At the registration table representatives will confirm your cell phone number (critical to participating in the evening's activities), email and may add a credit card for Express Check Out if desired. Bring your smart phone! If you don’t have one, roaming assistants with iPads will be present to help you bid, as well as a kiosk set up in the Silent Auction room. Seating - Your table number is located on the table card you receive when you enter the Conservatory after you exit the shuttle. Silent Auction - The Gala Silent Auction opens at 7:00 PM. Staggered closings begin at 9:30 PM. All Silent Auction bidding is via BIdPal only. Purchasing at a "BUY IT NOW" price guarantees you receive an item for its predetermined bid price. No other bids on the item are accepted after your BUY IT NOW purchase. Additional descriptions of the entire Silent Auction process - bidding, buying, BUY IT NOW purchasing and collecting your items - can be found at http://www.bidpal.com/how-to-bidpal/, as well as in the program guide found at each table the night of the event. Silent Auction volunteers are from the Interact Club and the WIN program. 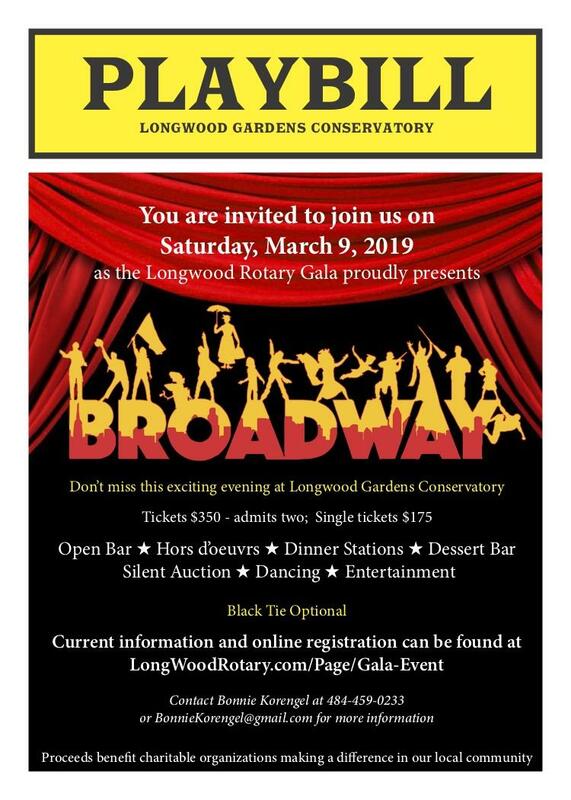 Longwood Rotary Gala is an annual fundraising event that helps area communities directly. Gala proceeds are used strictly for outreach, not for Club operating expenses. Thank you for your generous contributions!